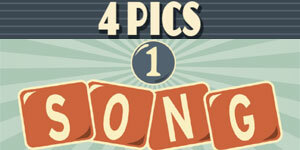 4 Pics 1 Song Cheats has the answers for all levels and all genres of the photo word game that's all about music. Use the site navigation to find the level of the game that you're stuck on and we'll give you the song title so you can move on to the next level. 4 Pics 1 Song Answers | 4 Pics 1 Song Cheats This site is not endorsed by or affiliated with Game Circus.